Last week one of my writing prompts was moving. When I first put that word on the list I’d figured I would write about moving house. But it came into my inbox right after Esther’s poetry and art post on Spirited Bodies, which is full of life drawings and embodied poems. After that there was no way I could read moving and not think bodies in motion. Couldn’t get the formatting right as text, so I took a screenshot. Apologies for the fuzziness! I think that touch of fuzziness adds a lot to the the visual presentation. I also feel movement in these words about moving, because of the formatting, but I wonder how I would react to this if I saw it performed– heard the lilt and emphasis of the words as you heard them in your mind, instead of relying on the voice in my head (which feels inadequate today.) It could be that I’m just worn out this week, but I can’t shake the feeling that I want to hear the muscle and the melody. That these words actually do need to physically move. I hope I’m not being off the wall here. I do think, though, that my attempt with this poem was a very literal translation of physical movements — so that if it were a voice-over to an actual set of movements, it would be more a set of instructions than an interesting multidisciplinary piece. It’d still be fun to watch, but it wouldn’t be two forms coming together to make a whole (the way a good graphic novel combines words and image, or a good song does lyrics and music). See, this is the artist in you, to take paper and text and move them about in a dance. I’m so linear with writing I would never have thought of that. And it adds so much to the thought of dance. The movement of words is a mirror of the movement of bodies. Great job. Thank you, Lisa! It’s always an interesting challenge to me, to try to translate one art medium into another. Another thought I had recently was to learn a little about DJing or remixing, and then try to apply those techniques to words. I don’t know anything about it so I don’t know if it would work, but I’m visualizing some kind of cutting and splicing and repetition. 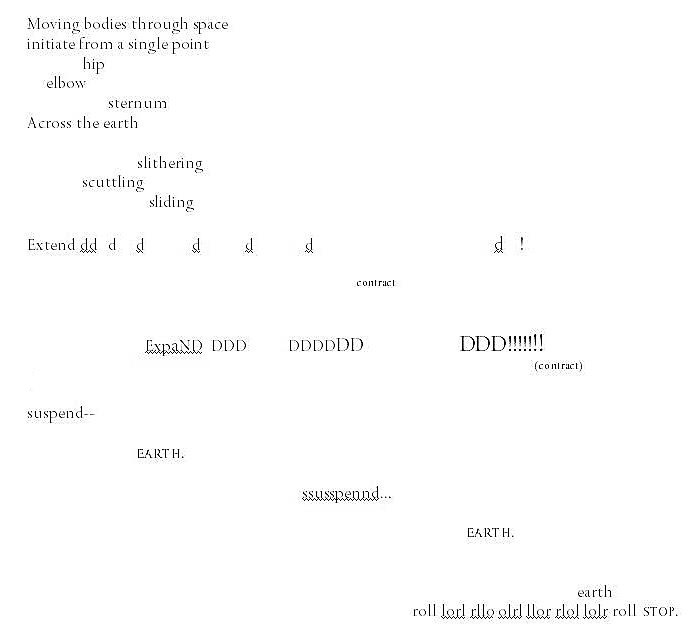 Is this what is called “concrete poetry” ? Not sure. Anyway, I like the way you layed it all out to bring out the stretch and movement. Nice one. I’d never heard of concrete poetry, but I looked it up — so interesting. 🙂 I don’t know if this qualifies either, but it felt natural to me to make the words move across the page. Glad you enjoyed it!